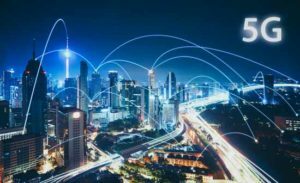 In 2018, major telecom carriers will begin rolling out 5G networks across the country, and the development could be one of the biggest ever. 5G is the successor to the 4G/LTE mobile network and will be 100x faster than 4G – and even 10x faster than the best home-subscriber broadband service. This technological leap is creating some incredible profit opportunities for tech stocks. According to Swedish network equipment manufacturer Ericsson ADR (Nasdaq: ERIC), new 5G-related features could produce as much as $1.3 trillion annually in additional revenue for carriers by 2026. In fact, some of the largest names in tech are already locking in gains – Qualcomm Inc. (Nasdaq: QCOM) and Cisco Systems Inc. (NYSE: CSCO) have both launched aggressive 5G initiatives over the last year. The 5G Rollout Is Creating a New "Gold Rush"
As with any significant technological advancement, critics have emerged from the woodwork, claiming that 5G is unlikely to foster any real growth since the mobile-carrier market is fully saturated with customers. You see, the nation's generation upgrade to 5G won't just benefit smartphone customers. The new network will allow industries previously constrained by the speed of older networks to expand exponentially. This includes companies exploring technologies like the Internet of Things, autonomous cars, "smart" cities, connected homes, and virtual reality. Thanks to 5G technology, mobile carriers will be able to provide a full range of wireless services, including broadband Internet and television. According to Alexander Brock – the senior vice-president of Rogers Communications, one of the several companies pursuing the 5G market – the full potential of this market is so revolutionary that there are opportunities we're not even aware of yet. "5G opens up all sorts of possibilities for applications and services we can't even dream of today because of the fact that you've essentially taken all the connectivity in a place and put it in your pocket. I think that opens up an enormous amount of innovation capability," he told The Globe and Mail in February. According to research firm Moor Insights & Strategy, spending on the 5G buildout through 2025 will exceed $326 billion. However, that initial investment pales in comparison to the potential revenue of $1.3 trillion in the first few years. The obvious stocks to buy to profit from this phenomenon are the big U.S. carriers: Verizon Communications Inc. (NYSE: VZ), AT&T Inc. (NYSE: T), and T-Mobile U.S. Inc. (Nasdaq: TMUS). These are all viable profit plays if you want to invest in tech stocks and take advantage of the 5G revolution. The biggest profit play in this sector is actually north of the border, in Canada. Canada-based Telus Corp. (NYSE: TU) is the best 5G telecom stock in North America. One way we know this is because it has a Money Morning VQScore™ of 4.15, a clear buy. Canada is one of the best nations for telecom companies. Since the top three companies avoid price competition, mobile plans in Canada are some of the world's most expensive. While this isn't great for customers, it's an excellent profit play for companies and their investors. Telus has market control over much of Canada's fiber optic cables and local transmitters, both of which are necessary to facilitate the high speeds of 5G data. From a financial standpoint, Telus is an incredibly healthy company. In Q4, the company reported an increase of 121,000 subscribers, representing its largest quarterly gain since 2011. This was following two quarters of strong net-subscriber gains. Telus is also the best at holding on to current subscribers, as evidenced by its low churn rate. Of the big three in Canada, Telus has a 0.99% churn rate. Rogers and BCI have 1.48% and 1.35%, respectively. The company is also forecasting between 4% and 7% growth for 2018, and this doesn't include any gains that it will achieve from 5G, which will not come online until 2019 or 2020. FactSet projects that earnings per share for Telus will be $2.48 in 2020. This equates to a 2020 price target of $47.12, considering the price/earnings ratio is currently at 19. Today's investor could earn a 33.56% return based on the current share price of $35.28. While Telus is an easy pick thanks to its high VQScore, not all cutting-edge stocks are so easy to find. That's why we follow the World's Greatest Stock Picker. His method has given readers the opportunity to lock in peak gains of 1,000% – repeatedly. And he's had a nearly perfect track record ever since. Although you stated TU has a VQ of 4.15, the related graph shows 1.75.